Prominent Russian researchers developed the Millimeter wave therapy. Millimeter waves help to correct imbalances through frequencies that reinforce the body’s own natural healing frequencies. This development of an innovative method to enhance the immune system for the treatment of infectious diseases is similar to vaccinations without the side effects. This device is based on the principle of controlled energy material (CEM). Inventors explain its operation as stemming from the characteristics of semi-conductor structures with a memory effect which prepares “photography” of E-field radiations or frequency from sick organs and/or bacterium. Then a special oscillator is used to restore these radiations or frequency to the organism. At the same time, a substitution process of pathological viruses and/or bacterium commences to create E-field frequencies/radiations of an external source to create homeostasis. The projection to the organism is intermittent and absolutely exact with the needed frequency characteristics. Bacterium that initiate sickness become suppressed and, inevitably, perish. The pathologic process disappears. The human organism does not suffer at the same time. Therefore, there exists no contra-indication at all in the use of this device. Adjustment of the CEM Tech device for the required resonant characteristics of a pathogenic factor is performed automatically through the creation of a photo of the illness in EHF RANGE, including all its spectral components. The influence of background (natural) radiation during the spectrum replacement of the illness spectrum in the organism is accounted for to enhance the oppression and destruction of the illness spectrum. Duration of treatment depends on the degree of disease development. The CEM Tech device and this method of natural healing is authorized by RF Health Ministry (Certificate of Conformance No ROSS RU.ME.B00426 TS 9444-002-28833138-96). 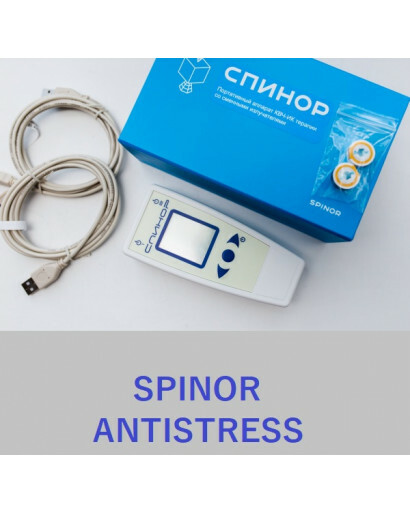 Its use is clinically approved and based on modern technology of producing materials with a controlled energy structure with the use of special semi-conductor crystals. 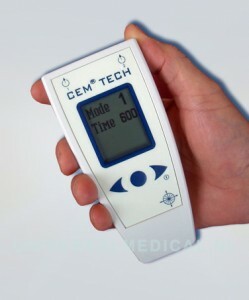 The CEM Tech device analyzes and blocks pathological electromagnetic radiation which always accompanies illness. This method makes it possible very quickly to achieve specific immunity from fast mutating viruses and bacteria, it does not create an effect of nonspecific allergization; the material, administered into the organism is not toxic. Thus, here is a real mechanism for an excellent and effective strategy against infectious diseases. The most acute opportunities of this new method includes an effective battle against fast-mutating viruses and bacteria (SARS, AIDS, etc. ); especially with dangerous infections, including ways of fighting against bioterrorism. 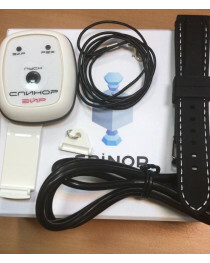 The device CEM Tech was developed subject to the analysis of known technical analogues and results of medicobiological researches with reference to a wide class of techniques in area of physio-, reflexo- and nosodotherapy. 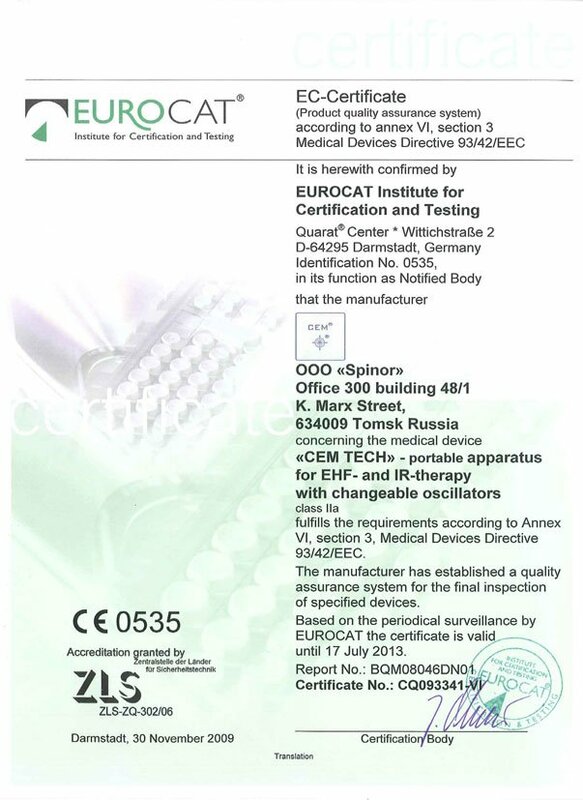 The device CEM Tech is honored with diplomas of Rospatent, the diploma and a silver medal of the exhibitions Eureka-2000 in Brussels, INPEX Pittsburg, gold medal of EWEI. 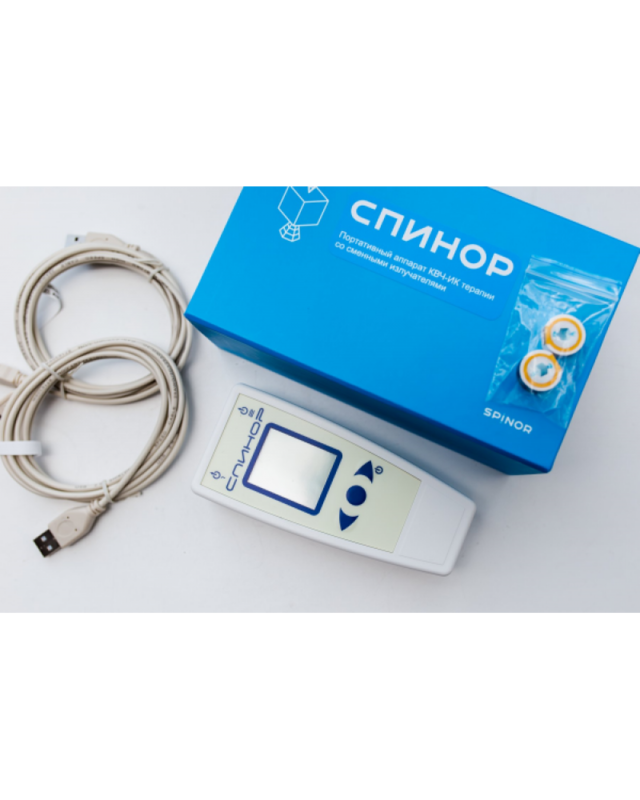 The device CEM Tech is effectively used for treatment in medical practice, and also in home conditions. The fastest clinical effect is achieved when pathological process is accompanied by expressed painful syndrome or local manifestation, has no expressed organo-structural changes and is located in tissues. 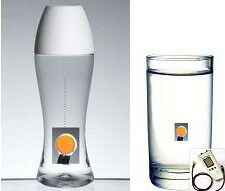 Creates Structured Water in 10 minutes for enhanced hydration! 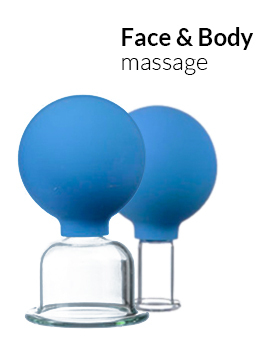 Treatment of these diseases can be carried out in home conditions, using the device as the only or a helpful means. Program 4 Mouth- and throat problem . Program 5 Heart- and vascular problems . Program 7 Stomach and intestine problems . 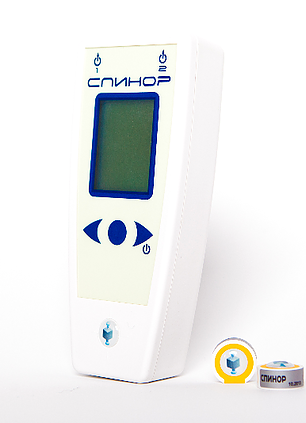 Device "РЎEM®-TECH" is universal and can be used in the recovery of various health disorders." allergic diseases accompanied with skin manifestations. Before use consult your doctor. if a patient has implanted devices with autonomous power supply, such as artificial cardiac pacemakers and the like. 1. The apparatus consists of a power supply and control block and remote replacement therapy emitters. Emitters are connected to channels 1 and 2 of the apparatus using flexible cable connector. 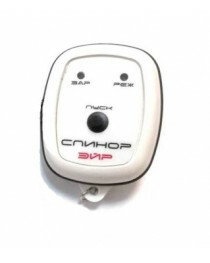 Cable length not less than 1m for emitters в„– 1-5. 3. Power flux density for the EHF emitters (в„– 1-3) directly to the output of the radiator at least 5 * 10-10 W/cm2. 4. Pulse repetition frequency of the radiation is in the range 0,1-20 Hz. 5. Number of channels the device for connecting the emitters: 2. 6. Power system: 2 AA batteries LR03. 7. Overall dimensions not more 90h190h70 mm. 8. Weight of the complete unit with radiator- no more than 400 g.
You can download English operating manual here - press button Download instruction please!. A therapist used this method for six years since 2001 and found the following result. 1. Ulcer and ulcers on duodenum: The healing of the ulcer for 98% of the cases, good health status during five years after treatment for 79%. 2. Chronic bronchitis and asthma: Improved status for 87%, good state of health for two years and more for 68%. 3. Complications because of diabetes type 1: Healing of grey cataract for 78%, healing of kidney problems for 52 %, healing of heart-and vessel problems for 58%. 13% of children treated with insulin could stop intake insulin (under control of endocrinologists). Improvements in their health status were confirmed by laboratory tests. For 89% complications disappeared because of stabilized health status. General improvement of health for 96%, continued good stats for a year or more for 45%. 4. Hypertonic: Stable status with lower blood pressure in connection with less taking of medications for 82%, stabilizing of status for 89%, continued good state of health for one year or more for 75%. 5. Heart and vessel diseases: Reduction of number of acute periods for 82%, reduction of daily intake of medicine for 94%, continued health status for 82%. 6. Liver diseases: (cirrhosis, hepatitis, heptoses): Improvement of biochemical parameters of the liver function for 82%, normalizing of the structure the organs (according to ultrasonic sound examination and computer tomography) for 58%, continued improver state for a year or more for 73%. 7. Diseases in the female reproduction system: improvements for 83% continued improved state for a year or more for 74%. 8. Diseases in the male reproduction system: Improved state for 72% continued improved state for a year or more for 68%. 9. Diseases of movement: Improved state for 86%, continued improved health state a year or more for 72%. 10. Allergies: Improved state for 84% continued improved state for a year or more for 62%. 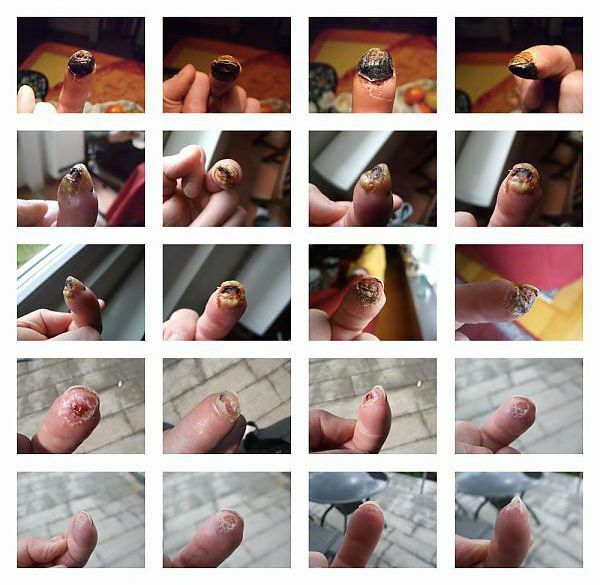 On a photo process of restoration of a finger after a trauma. The patient cut off part of finger by joiner's tool. The finger has been sewn into place. In the course of treatment the device CEM TECH was applied. Since a trauma has passed 3 months. The finger was completely restored.